Here's a cult movie as good as its exalted reputation. 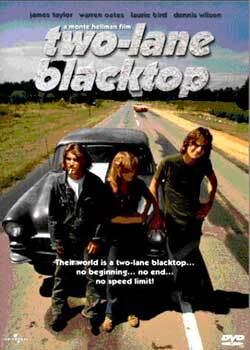 Made by Monte Hellman soon after he had directed a stage production of Waiting for Godot, this minimalist road movie, screeching tires and dust, with a legendary script by Will Corry and Rudy Wurlitzer, is the Roadrunner meets Kerouac meets Samuel Beckett. Vladimir and Estragon are James Taylor's Driver and Dennis Wilson's Mechanic on the road to nowhere, and their nonstop nonsense talk about car engines is a correlary go Lucky's dead-language Godot soliloquy. Pozzo is motor-mouth G.T.O, the late Warren Oates, wearing a different sweater in every car scene and delivering one magnificent performance. Hellman on his film: "I'm romantic in the sense Camus was romantic. I feel a nostalgia for what cannot be."